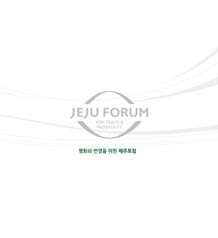 This is a brochure of the Jeju Forum for Peace and Prosperity. This is a brochure for the Jeju Forum 2019 as of April 18. This annual event brochure contains various themes of the sessions and key participants to the Jeju Forum 2019.